It started as an off-handed comment – you know, something similar to “A cold beer sure would be nice right now”. We had been living in Panama for some time at that point and at that time we owned a Nissan Patrol. As per usual we had been talking about what’s next and, as I recall, Cate commented that it would be cool to ship our Patrol to Colombia and have an epic road trip through South America, eventually ending in Ushuaia. People do similar things more often than you might think. We have a LOT of details to work out before we even begin but I feel confident enough that some version of that road trip will happen that I thought I’d do a post here – mostly so I can begin to organize my thoughts. We are already on the north side. We can purchase and register a vehicle in the US. It seems like it will be much less hassle if the vehicle registration is in the same country as our passports. We’ll be crossing a lot of borders so as of right now, this is my major concern. We’ll cover a lot more ground – if we decide to start on the north side, we might as well start in Prudhoe Bay, right? Wouldn’t need to bother with shipping a vehicle around the Darién Gap. We could avoid huge swaths of dodgy territory – there’s a fair bit of lawlessness along the route but in particular in Central America. Plenty of people seem to be selling their vehicles in either Buenos Aires or Santiago. These vehicles are generally fully equipped and have had various tweaks made during their trips so most of these are turn-key options. Would probably cut 6 months to 1 year off of our trip time. I’m not sure if this is an advantage or not. It is financially advantageous for us to mostly remain outside of the U.S. Starting on the south side of the gap would mean we haven’t got to concern ourselves with how much time we are in the U.S.
As of right now, I’m definitely in favor of starting on the north side and the plan we’re working on has us in Prudhoe Bay on 21 June 2017. Stay tuned…. This is awesome! Ligeia and I talked about this being a dream trip for us “one day”. 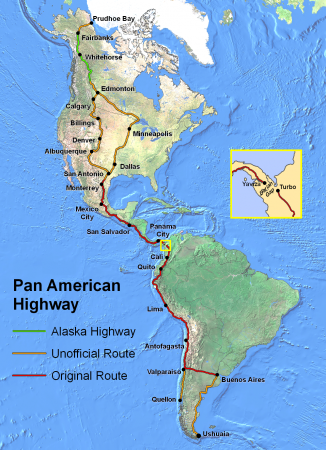 Our trip in the north would start in Dawson of the Yukon Territories, heading west first to Fairbanks along the Top of the World Highway (https://en.wikipedia.org/wiki/Top_of_the_World_Highway). You rock!